U.S. Attorney General Loretta Lynch: "This announcement does not mean that our investigation is complete ... We will continue to pursue the individuals responsible for orchestrating this damaging conspiracy." FRANKFURT -- Volkswagen investors demanded greater transparency and reforms at the carmaker after it admitted to criminal offences in rigging U.S. emissions tests and U.S. prosecutors indicted six current and former managers over the scandal. The German company agreed to pay $4.3 billion in civil and criminal fines in a settlement with the U.S. Justice Department on Wednesday, the largest ever U.S. penalty levied on an automaker. Volkswagen admitted about 40 employees at its VW and Audi brands deleted thousands of documents in an effort to hide from U.S. authorities the systematic use of so-called defeat devices to rig diesel emissions tests, a scale of wrongdoing that led some investors to call for deep reforms. "For senior management to receive any bonuses in 2017, we would now expect VW to deliver a dramatic improvement in profits," said Ben Walker, partner at activist hedge fund TCI, which last year publicly criticised "corporate excess on an epic scale" at the carmaker. "Seventeen billion euros of EBIT (earnings before interest and tax) should be the minimum amount for any bonus to be received by executive management. Below that, zero bonus," he wrote in an email, noting VW's admissions of guilt in the DoJ settlement did not extend to any board-level managers. VW set aside more than 18 billion euros to cover the cost of the diesel scandal -- a figure expected to raise in light of the U.S. deal. Moody's credit-rating agency said the deal could raise its provisions expectation of 21.2 billion euros by around 1 billion euros, but welcomed the removal of uncertainties. "The settlement agreement ... should also help VW and VW's management to refocus its efforts into the development of its operations, and therefore is a positive partially balancing the need to increase its provision," it wrote. VW has forecast an operating margin of 5 percent to 6 percent on expected sales of about 213 billion euros ($227 billion) for 2016, implying EBIT before expenses of about 10.6 billion to 12.8 billion euros. "What is most disturbing ... is the pattern of deception, both in developing and perfecting the defeat devices, as well as deliberately obstructing the subsequent investigation," said Annie Bersagel, an adviser for responsible investments at Norwegian Mutual Insurance company Kommunal Landspensjonskasse (KLP). KLP and KLP mutual funds have small investments in both VW equities and fixed income products. "Going forward we would like to see more truly independent directors. This may change governance at the company where we see some issues, for example the awarding of large bonuses to current and former managers. We would like to see a clawback provision relating to violations." Ingo Speich, a fund manager at Union Investment which holds about 0.6 percent of VW preference shares, said on Wednesday the company needed to "put everything on the table" about its wrongdoing to regain the trust of investors. VW still faces lawsuits from about 20 U.S. states and from U.S. investors, and will spend years buying back or fixing nearly 580,000 polluting U.S. vehicles. It also faces claims from customers in Europe and Asia, after it admitted in September 2015 that up to 11 million vehicles worldwide could have defeat device software installed. 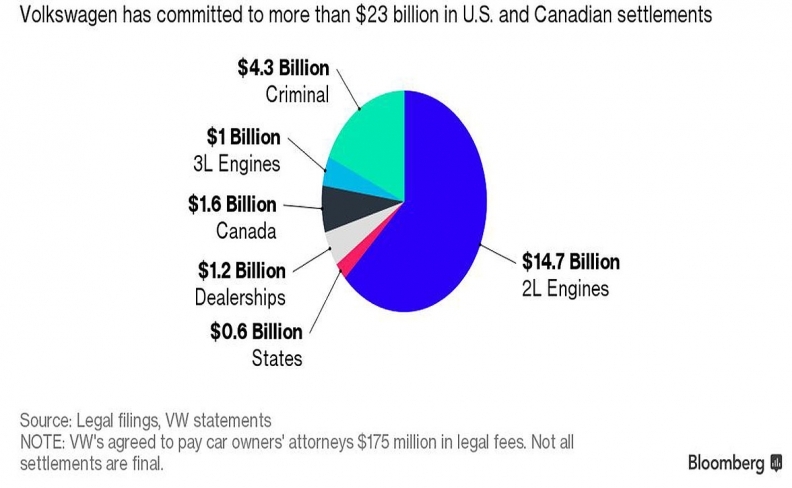 So far, the scandal has cost VW up to $23 billion in the U.S. and Canada alone, in deals with owners, regulators, U.S. states and dealers. Despite the fines, VW has continued to pay bonuses to top managers. For 2015, the year the scandal was uncovered, VW agreed to pay 12 current and former members of the management board at total of 63.2 million euros ($67.2 million) in fixed and flexible remuneration. It said board members would have 30 percent of their variable bonus awards withheld, if the share price remained below 140 euros. In total, six current and former VW managers have been indicted, including Heinz-Jakob Neusser, former head of development for the VW brand. Five of them are in Germany and it is unclear if they will come to the U.S. to face charges since Germany typically does not extradite its citizens. A seventh, engineer James Liang, has already pleaded guilty in U.S. court and faces sentencing on May 3. Liang, a German citizen who lives in Newbury Park, Calif., was charged with conspiring with current and former VW employees to mislead the U.S. government. He is cooperating with the ongoing investigation. While senior managers, none of them are -- or were -- members of VW's management board. 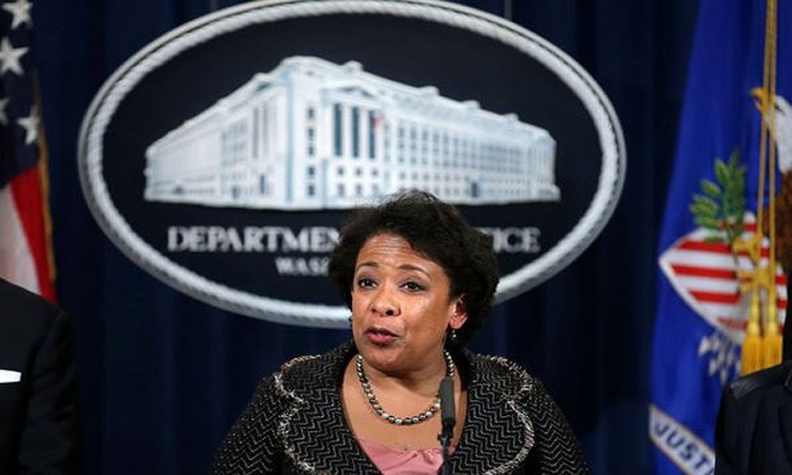 At a press conference in Washington, U.S. attorney general Loretta E. Lynch said U.S. authorities would continue to pursue those responsible for emissions cheating. "This announcement does not mean that our investigation is complete ... We will continue to pursue the individuals responsible for orchestrating this damaging conspiracy," Lynch said. The indictment said the six managers engaged in a 10-year conspiracy to cheat U.S. emissions tests and then cover up excessive emissions even as regulators questioned irregularities. VW CEO Matthias Mueller said in a statement the company "deeply regrets the behavior that gave rise to the diesel crisis" and vowed to continue changes in how the company operates.